Almost noone saw this, and here's why: the ISGC organisation team is excellent, and treats your safety as the first priority. Within moments of the fixture beginning to smoke, the security team was in place to ensure safety of the few participants who were not in session. 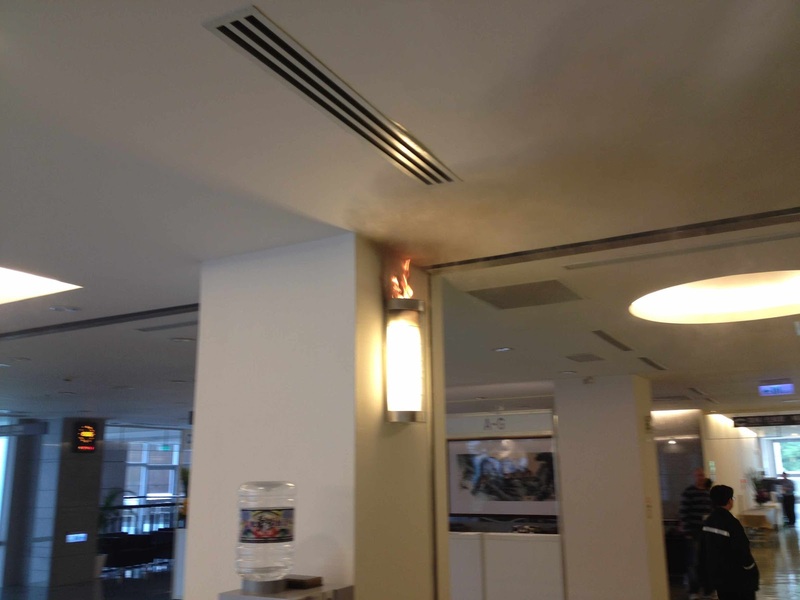 Organisation staff moved some personal items out of the immediate vicinity of the lamp, and the fault was quickly extinguished. The maintenance team then removed and replaced the fixture, cleaned the fire extinguisher remnants from the floor and wall and painted the smoke damaged area - all before the coffee break. I hope this shows how hard the team is working for your enjoyment! Exactly Tom, there was virtually no disturbance to the delegates at all. Nothing visible there now... and we all still got our coffee fix in the break! Weel done to the ASGC security team!